Welcome to Colonia Citizens Network Faction. You are here because you are considering making a potentially great move and joining us. We at CCN are a very welcoming bunch and look forward to new CMDR's joining our ranks. We are not here to dictate how you should play the game or even how much you have to contribute but we do expect an amount of activity to push the faction forwards. This wizard will take you through the steps required to become a full member. Please answer all and any questions honestly. The following guidelines outline the actions we expect from our pilots.There will always be exceptions to these rules but we would ask all Cmdrs to stay within these whenever they are representing CCN in game. This document is a living document that can and will be amended when necessary. CCN is a peaceful and cooperative organisation so please remember this when interacting with others in-game or in any form of social media. If there is any doubt as to the action you should take, direct questions to the Custodians via the CCN community Discord, or to the Diplomatic representative via the CEI discord. Keep faction business within the faction discord, remembering that CCN lobby may well host people from outside the Faction. Support the faction in the BGS by reading BGS Alerts. These will indicate what types of activities we should be carrying out in support of our current state. Any questions can be asked in BGS chat. All hostile activity involving player Cmdrs within the factions systems or against faction Cmdrs should be reported in the faction discord. All invites to the Faction Discord should be via the CCN Faction website, CCN Custodians may issue invites if required. Please do not post invites anywhere else. Please do not conduct actions that serve to undermine faction influence in any system we are present, unless asked to do so in the standing orders for that system. Â We will not work on actively destabilising a player held faction that controls a system, unless we are attacked by said faction first. Such actions will be led by the BGS coordinator. Whilst we do not expect Cmdrs to reside wholly in Colonia, we would encourage residence there so we can best support our activities. Being a member of multiple factions is not prohibited as long as the alternative faction is not in opposition to CCN. Ideally alternative factions should be Bubble-based. Faction business is to remain within the Faction Discord. Discussion of faction business outside may well be a threat to our ongoing activities. It is a members duty to keep up to date with ongoing activities and changes in the faction policy. Ignorance of the guidelines is not an excuse for breaking them. By agreeing to become a member of CCN you are joining a motivated team of players that have a vision, although we do not enforce a strict activity policy, we do need active commanders so please consider this before accepting a position in CCN as inactivity can lead to withdrawal of faction member status. 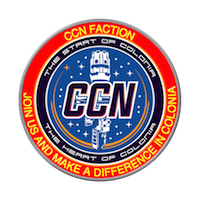 By clicking the Join Faction button I confirm that I wish to join the CCN Faction, I have read and agree to abide by the code of conduct above and understand that unexplained periods of inactivity could lead to withdrawal of faction member status. Thank you for choosing to join CCN. We look forward to welcoming you on our Discord server. You will now be taken to the Discord signup page. Sorry, looks like the Thargoids messed up your attempt to join us. Please try again.